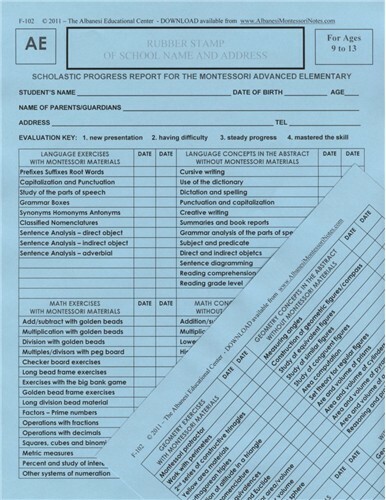 ADVANCED ELEMENTARY PROGRESS REPORTS/30 == The Progress Reports for the Advanced Elementary level (ages 10 to 13) are sold in packets of 30. All subjects pertinent to this age level (Language, Math, Geometry, Cultural and Social Conduct) are listed as topics of evaluation. These reports are not suitable for users of the ACP (Albanesi Curriculum Programs) because teacher's evaluations are approximate and subjective. The reports are designed for two students’ evaluations per academic year: one for the first semester and one for the second. A blank space at the top of the report is provided to enter the name and address of the school.